My Mom's Pickled Cabbage is an amazing, healthy snack/appetizer/side-dish that compliments many dishes. Not only is it delicious, but it is a natural way to increase the level of good enzymes in our digestive system since it contains probiotic bacteria. I prefer eating the right food to taking pills. Pickled cabbage can help especially after drinking alcohol or taking antibiotics, which destroy the good enzymes in our body. 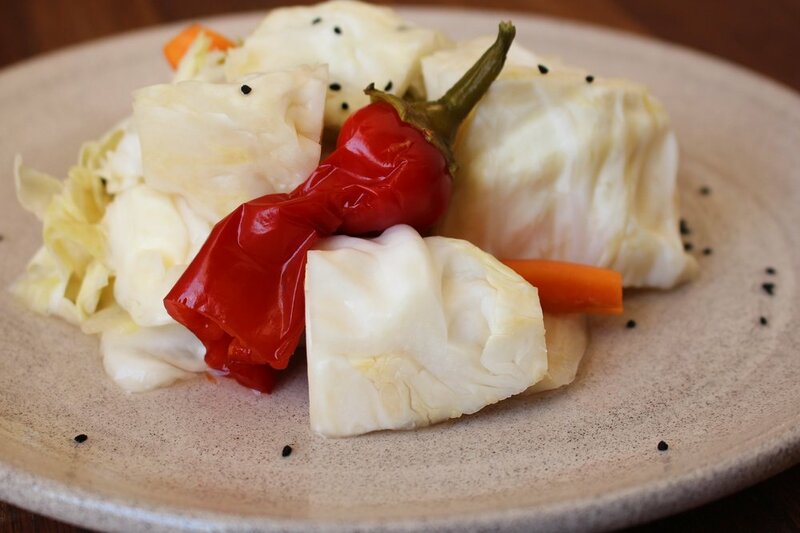 So, add this pickled cabbage to your menu to maintain a healthy digestive system. 4 celery stalks with the leaves, cut into 3"-4"
+On every cup of water add 1 teaspoon of salt, add as many cups of water as needed into the jar you are using. Take a large jar and fill with boiling water to cover. Let it sit for 10 minutes, then spill the water. The boiling water will sanitize the jar. Next start filling the jar with the vegetables, salt water and vinegar.